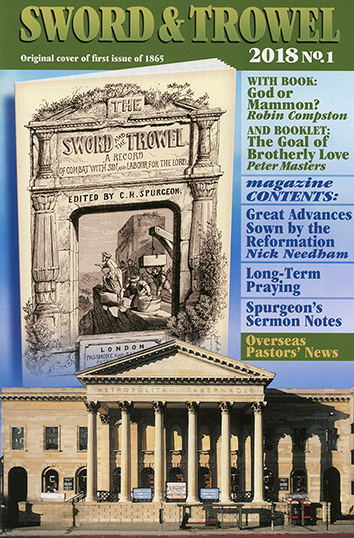 The Sword & Trowel magazine was started in 1865 by C. H. Spurgeon. Currently it enjoys an extensive readership throughout the world, especially among ministers and church leaders. Each issue of the Sword & Trowel includes a new book. The large number of subscribers enables both magazine and books to be produced at an extremely low price. - Why Did God Allow Sin? Subscribers pay about a quarter of the price subsequently charged for the magazine and book in bookshops. Most of the books are authored by Dr Peter Masters. Books and magazine articles have been translated and published in many other countries. "We would ply the Trowel with untiring hand for the building up of Jerusalem's dilapidated walls, and wield the Sword with vigour and valour against the enemies of the Truth."